World's first next-generation atomizer for metal powders production | 3DSystems - Orlas CREATOR – ATO Lab – Drukarki 3D - 3D Lab Sp. z o.o. Among the main causes of slow-moving implementation of 3D printing in industrial applications are the narrow range of available powders and long time required to introduce new alloys to the market. These problems stem from technical limitations of all the currently available metal powdering methods and high prices of the equipment itself. Classic atomization systems are expensive; they also require dedicated large-scale infrastructure and generate considerable operating costs. To this date, metal powder production has been focused primarily in the hands of multinational corporations with substantial financial bases. World’s first atomiser designed with office space use in mind has just been introduced. This device is dedicated to satisfy the needs arising in the field of additive manufacturing, isostatic pressing and conventional powder metallurgy. ATO Lab can speed up your research up to four times! The 3D printing technology allows for the creation of objects or parts with geometries impossible to obtain – until now. In combination with the new possibility of rapid and cost-effective production of metal powders, it has a potential to significantly contribute to the development of materials yet unknown – especially metallic nanomaterials – and, in further perspective, design of truly breakthrough products. ATO Lab has been created in response to the increasing demand of small and medium-sized enterprises, powder producers and scientific institutions. The atomiser is capable of processing both reactive and non-reactive metals, such as titanium, magnesium or aluminium alloys. It is capable of producing powders with medium grain sizes within the range of 20 to 100 μm and narrow grain size distribution. Up to several hundred grams of material can be produced in a single manufacturing process. A complete ATO Lab system includes the atomization device and software supporting the manufacturing process. ATO lab is in full compliance with the Industry 4.0 concept. It is an important part of a cost-effective process aimed at manufacturing short series and highly individualized products. The device is integrated with the newest communication systems through WiFi, Bluetooth, USB, Micro SD and Ethernet. This allows for smooth connection with the device and wireless work process monitoring as well as remote maintenance communication. ATO lab has the potential to considerably enchance and speed up the development of new materials dedicated to metal 3D printing. The device was designed as compact, with office spaces in mind, yet maintaining several times lower operation costs and an affordable price. This solution guarantees a more rapid novel material development process within lab organisational structure and eliminates the need to employ subcontractors to execute particular stages of a given project. The users are provided with a higher degree of control over subsequent stages of raw material processing. Thanks to its affordable price, the device allows an easy access to the technology for small and medium-sized entities. The company’s research in the field of atomisation has begun 3 years ago. It stemmed from the need to rapidly produce small quantities of feedstock for metal AM (additive manufacturing) research and process parameters selection. 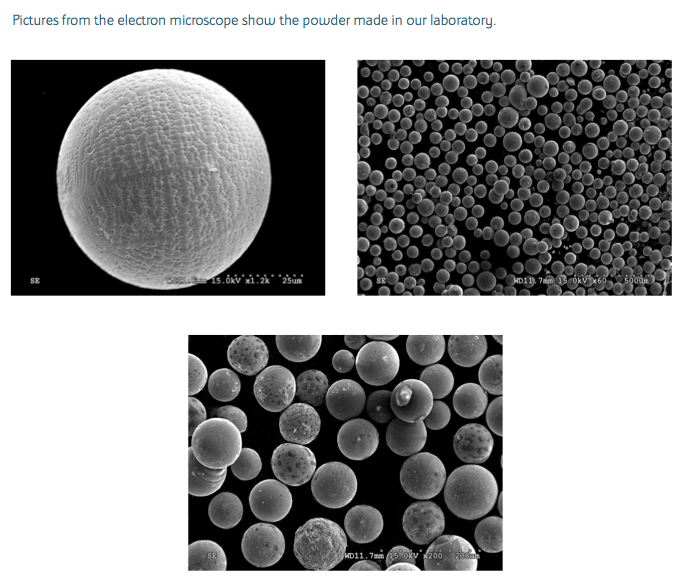 The 3D Lab team has found the range of commercially available powders to be very limited. Long realization time of smaller orders and high raw material costs made it impossible to implement a cost-effective solution using currently available atomisation methods. 3D Lab is a company with over 10 years of experience and an established position in the 3D printing industry. Its main focus is delivery and maintenance of additive manufacturing devices. 3D Lab has established a leading position in the field of professional and production-oriented AM systems in the domestic market. It also provides research and development services, commercial 3D printing, and parameter optimization of metal powders melting processes. A wide scope of cooperation with leading scientific centres allows 3D Lab to offer professional, comprehensive services, including preparation of material data sheets for the produced materials. Their direct contact with the commercial environment and cooperation with scientific institutions have inspired the company to work on an entirely new solution, the effects of which will be presented during the oncoming Formnext trade fair from 13 to 16 November 2018 in Frankfurt. The first devices are planned to be dispatched in the firs quarter of 2019.